LIVERMORE, Calif. — Indian Summer was on display at The Course at Wente Vineyards. High 70’s with a light breeze at one of the top golf courses in Northern California was the setting for the Dragon’s Season Finale. The 2018 golf season that started in April at Poppy Ridge, found its way back to Livermore, with stops at Yocha Dehe, Lake Merced, Sandpiper, DeLaveaga and San Juan Oaks. The club kept the action going with a Match Play Championship, NCGA and Chinese Federation Events. And of course, The Weekender team event in Santa Barbara, that came down to the wire. At the Finale, the races to be decided were the Match Play Championship, the Kirin Cup and the Dragon Cup. Mieko Sugimoto faced off against Mike Gui in the final group to determine the Match Play Champion. Could Mieko become the first female to capture that title? Could Gui pull off the double by winning the Match Play Championship and also finish ahead of Davis Lee to nab the Dragon Cup and be crowned the season-long points champ? Could anyone knock off Mike Lum for the Kirin Cup for the best low gross rounds of the year? The stakes were high and the points awarded were 50% higher for the Season Finale. Gui was easily facing the most pressure on the day. He had a stellar summer leading Team Black to victory at The Weekender, 2nd at De La and finishing 1st at San Juan Oaks. Gui’s play was on a mission, as he also rampaged through his Match Play bracket to the finals. But, he had to square off against one of the top 4 Match Play competitors in the club, in Mieko. She is consistently a top pick for the team events because of her Match Play prowess and had the record to prove it. Gui started off the match and round strong, but a snowman and a lost ball on the front 9 unnerved him, and Mieko went in the for the kill. Mike’s scores kept going higher and higher, and he seemed resigned to the fact that the Dragon Cup was out of reach. This affected the intensity for the rest of the foursome, and after very strong starts by Davis Lee and Chris Chong, they began fading, including Mieko. Gui’s spirit was not broken, even after some atrocious holes. All of a sudden, he found himself 2 down with 4 holes to play. And Davis’ game had deteriorated so far that if Mike could come back and win the Match Play, he could also conceivably move ahead of Davis in the standings. He had two putts to pull the match closer, but just burned the edges. Mieko, showing her clutch spirit, drained a putt on the 17th hole to close it out 2&1. Congrats to Mieko for winning the Match Play Championship, and to Mike Gui for finishing second out of the 24(?) competitors. 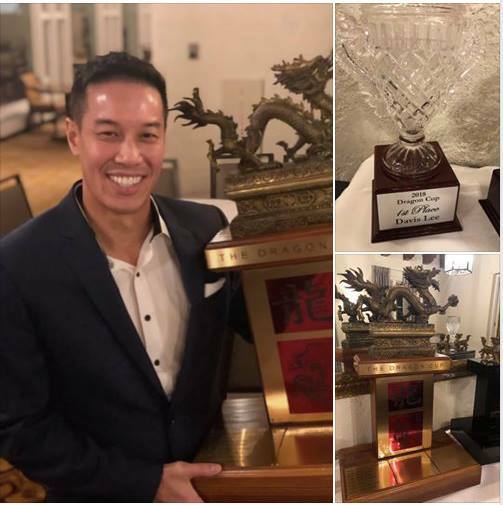 Mieko’s win all but assured Davis Lee of the Dragon Cup title, even though he wasn’t lighting the vineyards on fire with his play. Davis had an up and down season. He started off well, placing 2nd in his flight at Poppy Ridge, but then missed the Yoche Dehe, not playing well at Lake Merced, the Weekender and DeLaveaga. Somehow, the golf gods smiled down and he earned points because the rest of his Team Black squad triumphed, and his +8 net in his flight was still somehow good enough to win at DeLaveaga. A new driver turned his season around and he won the Chinese Federation event in Victoria, BC and also placed 1st in his flight at San Juan Oaks. In the A flight, there were some good scores on this tough track that featured OB on many holes. Rob Dang’s 85/net 72 nabbed 3rd low net over Tom Yee’s 80/net 72 via cardoff. Chris Wong shot an excellent 82/net 70 for 2nd low net. 1st low net went to Peter Lyu, who’s 76/net 70 was also good for low gross. Peter’s strong gross finish almost got him the Kirin Cup, which is awarded to the player with the best low gross finishes for the year. Mike Lum’s 77 was 2nd low gross on the day, and thus he retains the Kirin Cup. Congrats to Mike Lum as the standard that everyone will be taking aim at in the club. The B Flight had a great unexpected storyline. Scores were a touch higher, but still decent for a course that has been known to gobble up many balls and rounds. Karen Fong’s 92/net 76 was good for 3rd low net. This wrapped up a very strong season for Karen, as she was a quarter finalist in the Match Play competition, and was among the top four points leaders all season for the Dragon Cup. Jon Chong secured 2nd low net in the flight, shooting 91/net 75. The winner of the flight, was a very surprised older gentleman, wearing his customary red Dragon’s polo shirt and stylish white pants. In what would be his last tournament in the Dragon’s Golf Club, C.P. Liu went out a winner, firing a 98/74 to place 1st low net. C.P. is retiring from competitive golf and taking his talents to ballroom dancing. He will be missed as one of the most pleasant and generous contributors to the club. We will miss him and try to coax him out as a guest in the future. In our final look at the 2018 Dragon Cup standings, we find Davis Lee at the top with 991 points. Mike Gui came in second at 862 points, with Peter Lyu third at 723 points. Newcomer Fan Li came out firing from the beginning and had wrapped up the Rookie of the Year award — he finished the year with 650 points, 5th overall. We are looking forward to honoring all of our champion golfers on Sunday, November 18, when we reconvene at The Olympic Club for the DGC Holiday Party & Awards Banquet. Invitations will be going out soon, and we urge everyone of course to renew for the 2019 season — early renewals prior to the banquet week will get you a discount of 2019 dues, as well as bonus raffle tickets. Please visit https://dragonsgolfclub.org and renew now!